A stylish and unique way to store or transport your CD or DVD discs! These are original CShells ® made in the USA, not knock-offs. 40 CShells price includes Free Shipping! For Deb's delicious Baked Clams recipe click here. We ship same day nearly 100% of the orders received by 2 PM EST on business days. Custom CShells with your printed artwork are available. 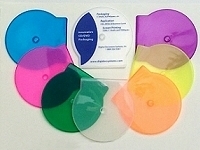 CShells come in various color assortments. Or you can specify the quantity of each color you wish in the comments spot on the order form and we'll be happy to pack your order that way. Bulk cartons hold 500 CShells. Please call toll free 888-556-5563 for larger quantities and further discounts!